University Trustee Gerry Lenfest ’58L is the benefactor who has done more than any other to build the faculty teaching in Columbia College. 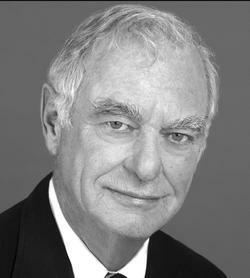 He will be presented with the 2011 Alexander Hamilton Medal on Thursday, November 17. Lenfest’s 2006 pledge to match gifts for endowed faculty chairs in the Arts and Sciences inspired other donors to create 25 new endowed professorships. The Distinguished Columbia Faculty Awards, established by Lenfest in 2005, also build this faculty by recognizing those who excel not only in research but also in the instruction and mentoring of undergraduate and graduate students. So far 53 faculty members have received the honor. The Hamilton Medal is awarded annually by the Columbia College Alumni Association for distinguished service to the College and accomplishment in any field of endeavor. It will be presented at the Alexander Hamilton Award Dinner, an annual black-tie event in Low Rotunda. Lenfest’s giving is remarkable for both its scale and enormous range. In 2006, in addition to his $37.5 million Arts and Sciences match, he pledged $10.5 million to match endowed professorships at his alma mater, the Law School. He has given extensively in support of the Lenfest Hall residence and other Law School projects and programs. His broad interests encompass promoting sustainable development and advanced solutions to global climate change and acute global poverty, including support for the Lenfest Center for Sustainable Energy, the Gary C. Comer Geochemistry Building at Lamont Doherty and other Earth Institute initiatives. Lenfest’s most recent commitments to the College include establishing, together with Board of Visitors Chair and University Trustee Jonathan S. Lavine ’88, a matching fund to endow five assistant professorships in the Core Curriculum. His commitments to the Campbell Sports Center and the Columbia University Libraries promise to have direct impact for students.